As Jeannot Aucoin would say, "To work with animals, you have to really like it." 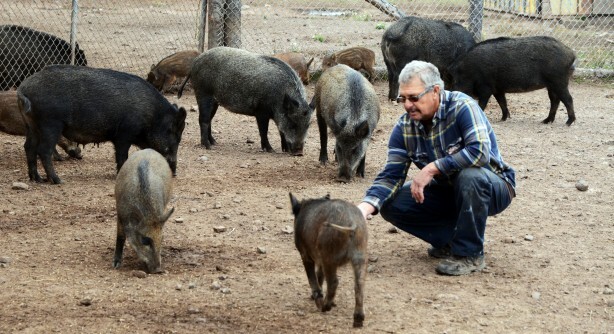 You won't doubt that for a second when you visit the boar farm Aucoin des Sangliers. In their 30 years of learning to work with boars, Jeannot and Gilberte have collected a wealth of stories and anecdotes about the ups and downs of raising these animals (tales that could inspire new Asterix & Obelix adventures). These free-range animals are almost exclusively fed local foods, including whey from the cheese production at the Fromagerie du Pied-de-Vent. Both adult and baby boars are fascinating creatures that are fun to watch. However, the arrival of the piglets is an event not to be missed. They are surely the islands' most adorable creatures and are just as cute as the seal pups! After your visit to the farm, stop off at the boutique to sample the sophisticated flavours of boar. Trust the island's chefs to serve up pulled boar worthy of Gaul's greatest warriors. Your taste buds will thank you. And by the way, the boutique at Aucoin des Sangliers is only a stone's throw away from Dune du Nord—the perfect spot for a walk by the ocean. The nectar of "Les Montants"